Summary: When her boyfriend dies a most untimely death, Aura--who can see ghosts--is forced to reconsider her relationship with the living and dead in SHADE. I have been wanting this soooooo bad! There are no words I can express as for how much I NEED this book! I would like to be entered!!! Oooh enter me please, this book looks awesome! This book is on the top of my to read list. I want to win this book more than ever. I would love to read this one. Sounds great. Shade! Need it! Enter me! I've been wanting this for such a long time! I'm silently freaking out with everyone else. So badly want to read this!! Enter me!! Another one I'm desperate to read! I want this one SO badly! Ah! Shade! Oh my.... Count me in, please! I'll say this now: Thank you so much for doing this! I want to read this one so bad!! OMG!!! been wanting to read this book!!! I've heard awesome things about this! Ah! I really want to read this book!!! oh i have been wanting to read this! I would love to enter this please. Total awesomeness! I've really been wanting this one. Please enter me. I want to get my hands on this book!! Another great one!! Please enter me!! Stephanie Kuehnert said some amazing things about this one and that's enough to make me want it! I'd love to be entered for this book! Thanks! I haven't read this one either. So many good books that you're giving away!!! This is already at the top of my wishlist, I so want to get a shot at winning a copy. I've read her other books and look forward to this series. 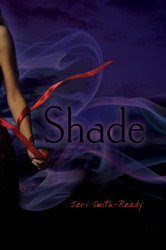 I soooo want to read Shade! Another great contest, thank you! I love her books and I really want to read this one! I'd like a chance at this book. I've heard good things about this book, would love to read it. I really want this one. Thanks for this giveaway! AHH! I've been dying to read this. Please enter me! I've been wanting to read this one for a while now. I really wan to read this book! I'm reading Jeri's book now. This book really awesome. ENter me in ! i want to read this book badly. This book has the most awesome cover! Thanks Princess! I love it! Ooooh! Shade!! I've heard great things about this book! It sounds really interesting! PLease enter me! I'd love that one, please enter me! Another great prize! Thanks for making it international. OOh I want this book! I cant wait tor ead Shade!! Please enter me! Would love to read this. Thanks! I'm dying to read this! YES! Please enter me! I've been dying to read this! Oh, this ones sounds so good and I love Jeri Smith-Ready. I really want to read this one! I love the cover. I'd love to have this book. Thanks for the contest. I would love to win this. I've read some of her other books. Wow, I so want to read this, please enter me.